Grill it. Anything….grill it. No ovens. Pop open that grill. Look in your fridge…what do you have? Me? besides ketchup…. Beets (another new obsession)…..red cabbage from my CSA….squash, onion, cilantro, cucumbers from the garden, and a whole chicken from the CSA. Hrmmm…. I am of the belief that when nearly anything is roasted or grilled, it makes it better…..like bacon. Grilled romaine is awesome, so why not cabbage? This is the easiest side dish. Cut a head of cabbage in 8 equal segments, keeping the core intact! This keeps all your pretty cabbage leaves together. Drizzle with olive oil and season with salt and pepper. Throw it on a preheated grill for 5 to 10 minutes per side. Delicious. Any cabbage would work…green, red, nappa….uhm. I’m sure there are others. Try it. I served the cabbage with a delicious cilantro-mint chimichurri sauce adapted from Mark Bittman’s Food Matters Cookbook. As part of the Food Matters Project, the featured Mark Bittman recipe was Mixed Grill with Chimichurri chosen by Lexi of Lexi’s kitchen. Check it out. Chimichurri is an Argentinian herby sauce similar to pesto, but is typically made from parsely. It amps up anything. I’m a cilantro and mint whore, and they are taking over my garden. So these two fab herbs went into the chimichurri. Side note. Does anyone else like to say chimichurri like I do? NO? anyone? just me? Sounds like a dance move. hrmmm…do the chimimimimichurri. Anyways, I used the leftover chimimimimichurri as a salad dressing for kale the next day. It’s like a secret power sauce and will make you want to do the chimichurri while you eat it. Note to self, add chimimimichurri to new food loves. 1 head of cabbage, sliced into 8 equal portion making sure to keep the core intact! This keeps your cabbage segments from falling apart. Preheat grill for direct heat. Drizzle about 1 to 2 tablespoons of olive oil over cabbage segments. Season generously with salt and pepper. 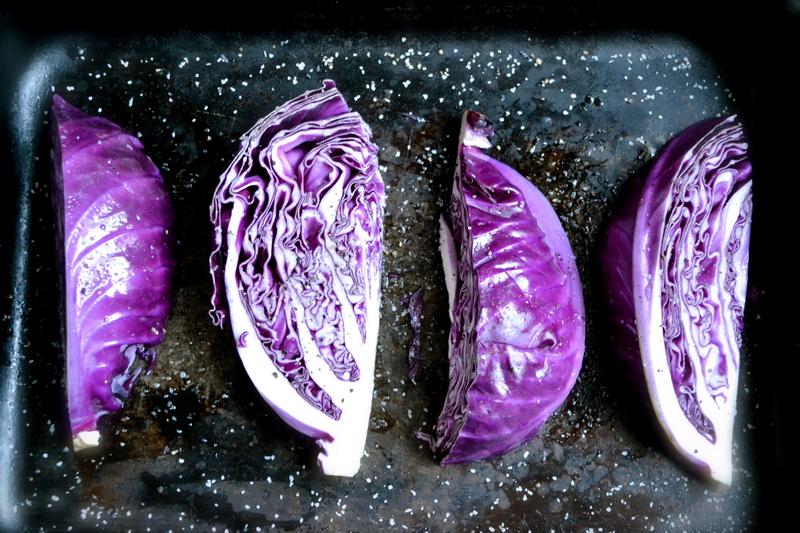 Carefully place cabbage onto grill, allowing to cook on one side for 5 to 10 minutes. You want those lovely grill marks. Carefully flip and cook on the other side for about 5 minutes, making sure to not completely char your cabbage. I like the edges slightly roasted. Remove from grill. Meanwhile, back at the ranch (or your kitchen), place the remaining ingredients (cilantro through black pepper) into a food processor or blender. Whirl and whirl until finely chopped. Pour into a jar. Spoon sauce over grilled cabbage and anything else that you want. This is really creative Alissa, love it! Yum, grilled cabbage, I love this!! I also used mint but with parsley and oregano. Love the addition of cilantro! Never would have thought to grill cabbage (not that I have a grill to grill it on anyway) but I bet it’s great. I wanna put chimichimimichurri on everything!